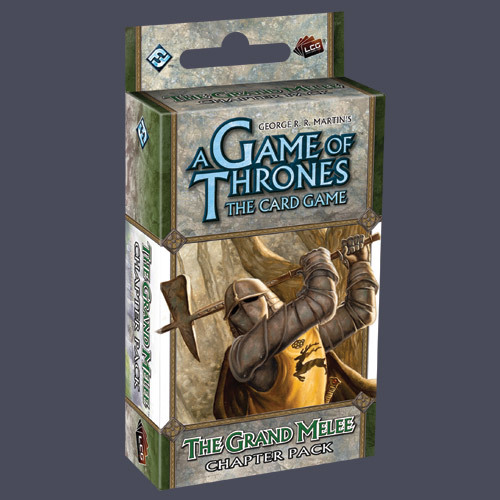 The Grand Melee is the second monthly installment of 60 fixed cardsâ€“3 copies each of 20 different cardsâ€“for the A Tale of Champions expansion to A Game of Thrones: The Card Game. The never-before-seen cards in this expansion are designed to augment existing decks and add variety to the A Game of Thrones experience. Featuring new versions of favorite characters like Robert Baratheon, Varys, and Thoros of Myr, developed especially for the new environment of A Tale of Champions, as well as introducing brand-new cards like The Smalljon, Captain of the Iron Fleet, and In the Name of the King, The Grand Melee has plenty to interest A Game of Thrones players, both new and veteran. An A Game of Thrones: The Card Game core set is required to play. Contains cards 21-40 of the A Tale of Champions series.